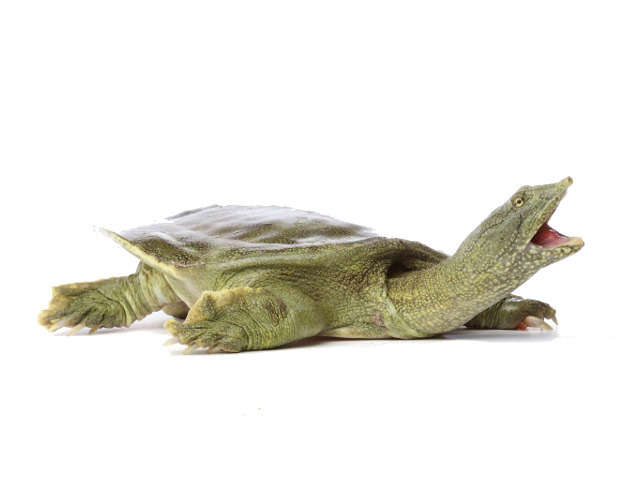 Sometimes referred to as a ‘Dwarf Softshell Turtle’, this Asian species is well adapted to an aquatic lifestyle with highly webbed feet and streamlined shell. Colouration varies from olive green to brown tan with white spots, allowing them to blend in with the muddy or sandy floor of rivers and ponds. Softshells, as their name implies, lack the strong protective safety of a regular turtle shell, instead possessing a leathery covering. This allows them to be extremely agile, however it also makes them more delicate and prone to injury. Chinese Softshells are extremely active turtles, which spend most of their time in the water and require a great deal of swimming space. Chinese Softshells grow to a considerable size, and are more aquatic than many other freshwater turtle species, so require a large swimming space. A large amount of water is also necessary to dilute the waste which the turtles produce. Young turtles can be kept in 20 gallon aquariums which can be upgraded as they grow, and aquariums of 75-100 gallon are recommended for an adult specimen. Longer and wider aquariums or even stock tanks and indoor ponds provide more usable swimming space and are great alternatives. Whilst adults can handle deep water without issue, younger turtles easily tire and are best kept in shallower water, or in a tank with plenty of areas to rest near the surface such as submerged plants or wood. Like any turtle, Softshells can be clumsy and when rough or sharp tank decorations are available they can quite easily injure themselves. This makes the species particularly vulnerable to bacterial or fungal infections and requires all tank decoration to be checked over for sharp corners before use. They will make great use of live or artificial plants, or rounded stones and bogwood as hiding places. Chinese Softshells require a basking area, although they are very nervous, and are quick to return to the water when disturbed. Providing the option to bask is fundamental, particularly in this species as they will bask in order to prevent fungal/bacterial shell infections and respiratory infections. Basking areas can be provided using a range of methods, but it must be an area where the turtle can climb completely out of the water and dry off. Easy, natural looking basking areas can be made from corkbark or driftwood. Rocks can be used, but Softshells are strong animals and will dislodge rock piles, and can be trapped underwater by falling rocks. Commercially available basking areas can be used, which can be attached to the glass of an aquarium by suction cups. This species is territorial and very aggressive, and should be housed singly. Fighting often occurs in this species when kept together, particularly at feeding time, and they possess a powerful bite which can severely injure tank mates. In nature, they burrow into the sandy bottoms of lakes and rivers and stay completely buried when threatened and young softshells do this frequently, although become more confident as they grow. In captivity, this should be replicated by using a 2″ thick layer of fine aquarium sand or playsand. Avoid gravel or building sand as it can be abrasive and cause injury. The water temperature should be kept between 24-29°C (75-84°F), which can be achieved using a submersible aquarium heater available for tropical fish. This should be fitted with a heater guard to prevent accidental burns or damage to the glass. Above the basking area, a heat lamp or spotlight can be suspended to warm the basking area to 32°C (90°F). All turtles benefit from UVB lighting to enable Vitamin D3 production and calcium absorption, and this should be provided with a fluorescent UVB tube over the basking area, or using a combined heat and UVB mercury-vapor bulb. An aquarium filter should also be used to help keep the water clean and provide a water current. External canister filters are the best choice for large messy species like the Chinese Softshell to ensure optimal water quality. These turtles are tolerant of a wide range pH, although keeping the water more acidic and towards pH 6 is useful in preventing skin and shell infections. Chinese Softshells are predominantly carnivorous, and are adept at hunting aquatic invertebrates, molluscs and fish. Young animals can be offered bloodworm, krill, chopped earthworms, mussels, cockles, and lancefish, as well as a balanced commercial pellet diet such as Mazuri, ZooMed or ReptoMin. They have a very strong beak designed for crushing snail and crab shells, and adults can be offered aquatic snails as enrichment. Whilst young softshells rarely bother with plant matter, keeping Elodea, Water Hyacinth or Duckweed in the enclosures provides a grazing food source. Cuttlefish bone with the hard backing removed can also be floated in the water as a source of calcium for the turtles to graze on when desired. Handling Chinese Softshell Turtles should be kept to a minimum as this is a very nervous species out of water, and often immediately resorts to defensive biting behaviour. If handling is required for a health check, protective gloves are worth using as this species not only has a very sharp beak and claws, but also an extremely long neck allowing it’s bite to reach a large distance around the shell. Hands should be washed before and after handling any turtle. General maintenance for this species involves a partial water change (25-50% depending on waste levels in the tank), cleaning of the filter media in the old water to remove any sludge whilst preserving levels of good bacteria, and the occasional rinse or siphoning of the substrate to remove trapped debris. As this species grows quite large, they can produce a lot of waste so cleaning is generally required every 1-2 weeks. The lack of a hard shell covering makes this species easily injured from scrapes and cuts on tank décor, which are then open to fungal and bacterial infections if water quality is poor. Maintaining a clean , well filtered tank, and providing a basking area will help prevent this. Indian Almond (Catappa) leaves can be added to the water to ward of infection although they cause some unsightly staining of the water. Softshell turtles are also easily overfed which can cause internal damage. A good rule-of-thumb is to feed an amount of food equal to the size of the turtle’s head if it were hollow, once a day for young turtles, once every 2-3 days for adults.